I have read on Meta about flagging, and I see the badge descriptions and whatnot, but I cannot for my life find out how to flag something. It feels like I have looked everywhere, and it's like hunting a ghost. Is there a link somewhere in the posts that you're supposed to click to flag it, or am I perhaps not able to see it because of low reputation? The term and the expression "to raise the red flag" come from various usages of real flags throughout history. The semaphore red flag (or red light) on railways means an immediate stop, while a red flag is frequently flown by armed forces to warn the public of live fire exercises in progress, and is sometimes flown by ships carrying munitions (in this context it is actually the flag for the letter B in the International maritime signal flag alphabet, a red swallow-tailed flag). In many countries a red flag is flown to signify that an outdoor shooting range is in use. The United States Air Force refers to its largest annual exercise as red flag operation. Red flags are used for various signals in team sailing races (see Racing Rules of Sailing). A red flag warning is a signal of high wildfire danger and a red flag on the beach warns of dangerous water conditions (double red flags indicate beach closure). Red flags of various designs indicate dangerous wind and wave conditions for mariners. In auto racing, a red flag indicates a stop to the race due to dangerous conditions. "Flags" are the metaphorical name for a signal raised on a post to indicate a problem. The nature of the problem can be indicated by the type of flag that is raised: common flag types include "Spam", "Not an Answer", and "Close". Flagging is the most basic form of moderation available to members of Stack Overflow, and most folks' first introduction to the community-led moderation system that drives the entire site. Flags can be handled by other members who've earned the privilege to participate in more advanced forms of moderation, by elected moderators, and by the system itself. Am I misusing the “Very Low Quality” flag? Why was this custom flag declined when there is no VLQ option? If I flag a question as low quality, will I lose my vote to close? Which standard flag should I use for a link-only answer that should be a comment? 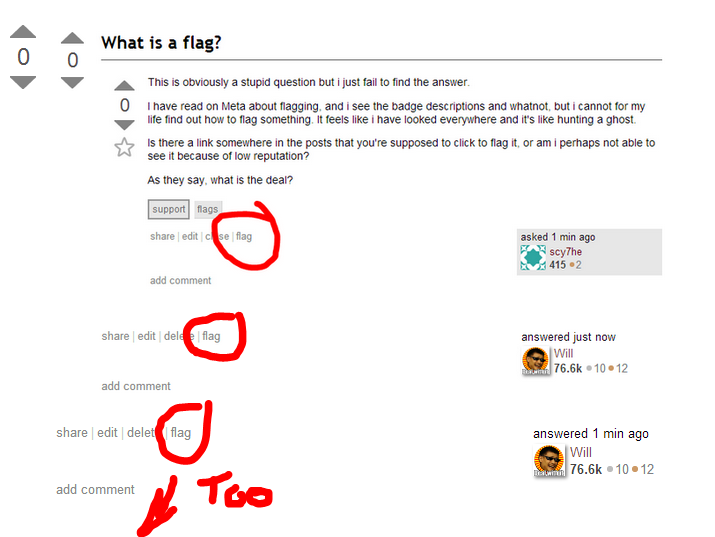 Helpful flags with option “very low quality”. Is this considered “hacking”?